Distinctive native plant often seen clinging to our rocky coastline. 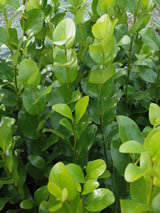 The glossy green leathery leaves grow huge as the plant matures. Small green flowers in spring are followed by green to black fruits loved by birds. Prefers to be sheltered from frost, but hardy to dry exposed conditions. 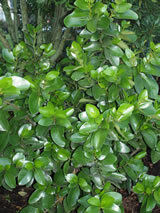 Will grow into a large bush in a garden situation. Occurs naturally as an epiphyte in lowland forests from North Cape to Dusky Sounds, east of the main divide it is replaced by G. littoralis. Small 4.5 to 9 metres. We have this currently available in a Pot 8.5 & POT 3.5 containers. Ask for them at your retailer.